Have you ever wanted to build your own website, or learn how to customize the appearance of your Blog posts? Well, now you can! 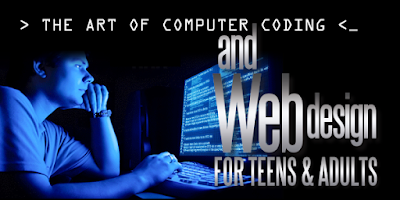 Through July 23rd, an instructor from Bitwise/Geek Academy is teaching teen classes on coding and web design at the West Fresno Branch Library. Classes are designed to give you extensive opportunities to build your skills and create a final portfolio of your work to showcase your coding achievements. There is no registration fee for these classes and sessions are offered Thursdays (5-7 PM) and Saturdays (2-4 PM). These classes are expected to be popular, so if you're interested please call the branch at (559) 600-9277 to register and save your seat.